The cartographer's name (Blome) was removed from the cartouche when Strype began editing the project. Bedford House and its garden, demolished in 1706, have given way to the Southampton Street, Tavistock Street and Tavistock Row. 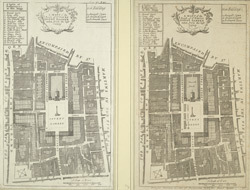 A list of new buildings appears in the top right corner: Marigold Court, Tavistock Court, Denmark Court.